How can I enter multiple lists for my school? If you have multiple lists that you need to enter for your school, simply enter your first list and save it. Then, in your dashboard, hover over this list and click “copy”. This will copy the list so that you can then edit and save it as a different list. It is typically saved with the word “COPY” at the end of the original Supply List name. Simply edit this list and save it with whatever name you would like the list to be titled. Having trouble adding an item? While adding a supply item to your list, the system automatically tries to identify the item as you’re typing and offer suggestions. This can save you TONS of time! However, if you don’t see the item even after typing it in completely, it may be listed under a different name (ex: filler paper is also called loose leaf paper) OR if it’s a very specialized item, we may not have it in our database. If after entering the item, you don’t see it in the drop down list to choose, simply click on the option “click here to add this item”. This will enter it as a “custom item” exactly as written. How are lists displayed for my school? 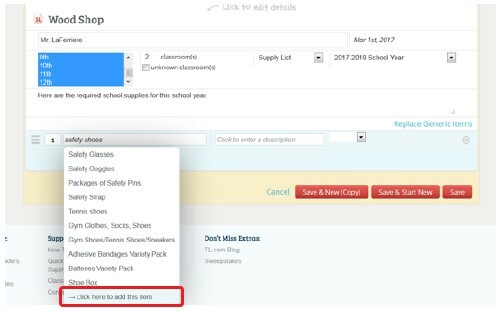 Lists are automatically placed in order by grade level, with the lowest grade appearing at the top. Current Supply Lists are on top, Wish Lists next, and finally any prior year’s Supply Lists at the bottom of the school page. This allows your parents to find their child’s current supply lists on the run quickly & easily. Teachers with multiple classes (Art, PE, etc.) will be placed with the lowest grade level. Within the same grade level, lists are then placed in alphabetical order by the teacher’s name. Why should I add a sponsored item to my list? Corporate sponsors help to make TeacherLists free for parents and schools to use. The brand sponsors that we choose to work with are carefully screened to ensure that they offer the high quality products that our schools and parents rely on. Many of these brands are already on thousands of supply lists across the country. Parents have told us how convenient it is to have images to choose items by when they are viewing their lists especially when viewing them on the go with their mobile device. However, schools are never required to choose a sponsored product for their lists. You should always choose the product that makes the most sense for your school and students. While you are never required to add a sponsored item to your list, we do ask that you consider adding one of our trusted partners to your list. In fact, we frequently run promotions offering incentives for adding sponsored brands to School Supply Lists. Again, though – this is always voluntary and never a requirement to use our free site.